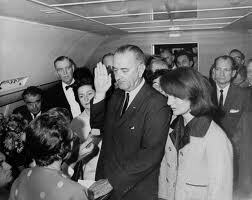 President Johnson being sworn in a short time after Kennedy’s assination, standing next to Jacqueline Kennedy on Air Force 1 while on the tarmac at Love Field, Dallas. Mrs. Kennedy was in shock and her dress was still splattered with her husband’s blood. When John F. Kennedy was assassinated in Dallas on November 22, 1963, Lydon Johnson became president of the United States. As many remember, he was sworn in on the same plane that brought Kennedy to Texas, and that was about to take him, along with Jacqueline Kennedy – and the coffin of the slain President – back to Washington, DC. Johnson had been marginalized as an almost totally powerless Vice President. Suddenly he found himself in one of the most challenging situations any leader has ever faced. Most of Kennedy’s staff and cabinet – especially Kennedy’s brother Robert, the Attorney General – detested him, Kennedy’s legislative agenda was stalled in Congress with very little time left to pass it, and there was a general distrust of anyone from the very state in which the President was shot. On top of all that, there was genuine concern that Kennedy’s killing was part of a much larger conspiracy to take out the entire leadership of the United States government. Perhaps the most serious of the many challenges Johnson faced during the first few days of office, was a speech to a joint session of Congress outlining his agenda and, in a sense, introducing himself to the American people. As Caro writes, “Men who regarded themselves as his friends, who had known him or worked with him for a long time and had heard him make many speeches, were very worried.” Johnson was a terrible public speaker. He had a tendency to wave his arms and bellow and talk too fast, despite repeated advice to reign in those tendencies. That may not have mattered so much as a Senator, or even a Vice President, but in a televised speech to Congress – his first as President – it would have been disastrous. Johnson was hugely successful in getting Kennedy’s proposals enacted into law. He also got a landmark civil rights bill passed – one that nobody thought was possible at the time. An Alexander Technique take on all this is that, first, Johnson was able to powerfully re-direct his energies by an act of will while at the same time preventing (“inhibiting” in Alexander Technique jargon) harmful habits of movement and expression. And in a situation where he needed extra help – and needed it quickly – he devised a strategy to help him prevent habitual patterns associated with that specific situation. This was a very different strategy than the one used by F. Matthias Alexander in overcoming his own public speaking issues, although the “pause” part certainly resonates with Alexander Technique thinking. I suspect that any teacher of the Alexander Technique who works with students wanting to improve their speaking skills advises them to slow down – often to slow down far, far more than they think is “natural.” It is, after all, in the pauses, that the audience can absorb a speaker’s message. When someone speaks too quickly, the message goes right past their audience. It is also the case that the time needed for an effective pause in speaking is pretty much the same amount of time needed to easily let the air out of your lungs and allow fresh air to flow in. You’re a lot less likely to gasp for breath if you take plenty of time to pause. My favorite example of the power of the pause occurs in a speech given by Winston Churchill in 1940, one of the darkest times for the British in World War II. The speech, commonly referred to as “We Shall Fight on the Beaches,” is thought by many to be one of the most important in modern history. You might want to practice speaking more slowly and seeing how that effects the reactions of the people you’re speaking to. And when you next hear someone who you sense is an effective speaker, pay attention to the pauses. More often than not, it’s in the pauses that the real power of speech resides. In becoming President Johnson perhaps threw off immediately the huge emotional tension of playing second fiddle, allowing his posture to reflect his inner state and literally to rise to the occasion. Perhaps it’s time for a new phrase to enter the language: the Power Pause. What do you think?